You are here: Home>Topics>Oughterard G.A.A.>Who was Sam Maguire? The arrival of Paul Gogarty as the celebrity Bainisteor created great excitement in the town last weekend July 3rd. Very few people knew him but after the initial shock of not meeting the expected woman celebrity people gave Paul an enthusiastic welcome. We wish him the very best with the Oughterard football team in the up coming competition. Now that we are all focused on GAA history both past and present one is often asked “Who was Sam Maguire?” During the summer months every county senior football team strive to reach their ultimate goal which is to win the most coveted prize in GAA the Sam Maguire Cup by winning the All Ireland Final in September. 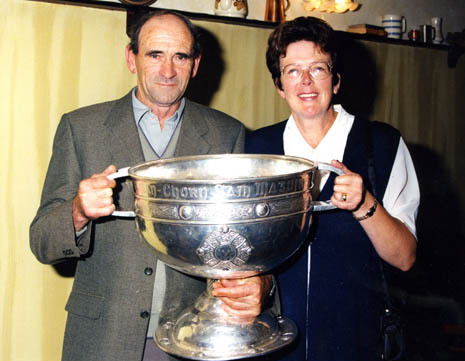 Sam Maguire was born at Mallabracka, which is a town-land north of Dunmanway, Co. Cork, in 1877. His family home in now in ruin. There was nothing big or grand about the place, just the home of a successful and highly respected Protestant farmer. There were five in the family, three boys, Willie, Paul and Sam and two girls, Molly and Lizzie. Paul married a local girl by the name of Hurley, a Catholic, and immigrated to America. The others all remained single and lived together. Sam was a student of great ability. After attending the National School, he joined the British Civil Service in 1899 and was assigned to London. He joined the Irish organization promoted by the exiles in London. He became very much involved in G.A.A. affairs, as he was a staunch upholder of the G.A.A. as well as a patriotic Irishman, prepared to risk all for the cause of his country. In the G.A.A., he was in his element whether as a player or as an official. He was courageous and outspoken and this earned him great respect. He was a popular figure and a capable organizer. He was an outstanding footballer, playing in three all Ireland Finals with London Irish in 1900, 1901,and 1903. 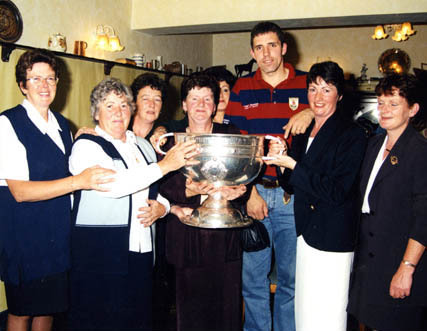 Sam Maguire did not confine himself to the playing field. In 1907 he was elected President of the London, County G.A.A. Board, Liam Mc Carthy then becoming Vice President. Sam’s adherence to all that was Irish inevitably influenced him when his country called for sterner measures. He became Lieutenant General of the I.R.A. and Director of Intelligence in Britain. He was an intimate friend of Michael Collins with whom he had close associations in London. He was a father figure to Michael Collins, being 11 years his elder. He recruited Michael Collins into the Irish Republican Brotherhood (IRB). In England he had to arrange for the transfer of arms and ammunition to Ireland. This was indeed a hazardous task, which, he carried through with remarkable success. Due to these activities, he was imprisoned and removed from his post in the Civil Service. After the treaty of 1921, he lived for a short time in Dublin, having entered the New Civil Service, but his restless militant spirit caused him to clash with his supervisors. 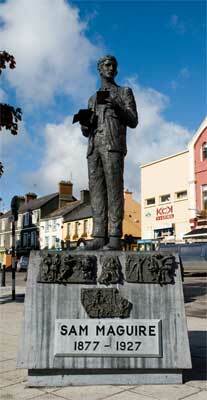 In 1924 his health failed and he returned to his native Dunmanway. Following his death from starvation almost alone and forgotten in West Cork in 1927, a group of his friends formed a committee in Dublin under the chairmanship of Dr Pat Mc Cartan from Carrickmore, Co Tyrone, to raise funds for a permanent commemoration of his name. They decided on a cup to be presented to the G.A.A . The Association was proud to accept the cup. At the time it cost £300. In today’s terms that sum is equivalent to £25,392. The cup is modeled on the Ardagh Chalice and was made by Hopkins and Hopkins of O Connell Bridge Dublin. The cup was donated in 1928. Kildare was the first county to win the “Sam Maguire Cup” in 1928 after defeating Cavan 2-6 to 2-5. Galway won the Sam Maguire in 1934, 1938, 1956, 1964, 1965, 1966, 1998 and 2001. Even though the cup aged with grace if had to be replaced following the 1987 championship. Meath’s, Joe Cassells was the first recipient of “Sam Og”. 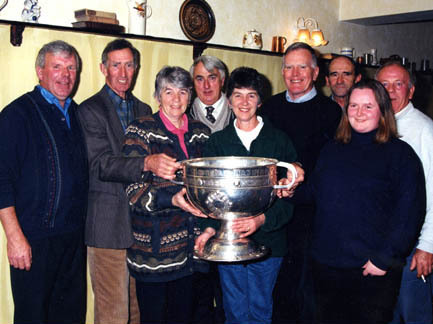 Meath have the distinction of being the last team to lift the old Sam Maguire and the first team to lift the new Sam Maguire following their back–to–back victories in 1987and 1988. As so often happens the Maguire farm was left without an heir and old age forced the family to dispose of the farm. The Irish Land Commission took over the farm in 1935. In the divide up, seven local small landowners each got approximately 7 hectares of what was deemed agricultural land. The remaining part of the land was planted by the State Forestry Department. Early in 1980 local feeling was such that it was felt that the memory of Sam Maguire deserved something in the centenary year 1984. The thought of taking over the family home was reluctantly abandoned because of its remoteness (i.e. distance from the public road) and the run down state of the building. “ Coillte” came to the rescue with a road side site (part of the former Maguire lands) and parking facilities and a picnic area was made available. A memorial plaque is in place there. His grave, in a churchyard in the town, is marked by a monument, erected by his friends and associates who also presented to the G.A.A. the cup, which carries his name. We call this cup, “The Sam Maguire Cup”. This page was added on 06/07/2011. Thank you for your observation Susan, I have corrected the error and have added a screenshot of his birth record. I don’t know why so many bios of Sam Maguire repeat the same error, but his birth is actually recorded in March of 1877. It is very easy to look up the civil registration records online and verify. Cheers.